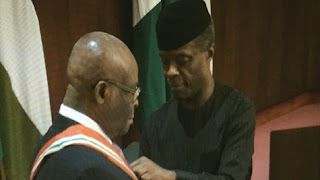 Justice Walter Onnoghen of the Supreme Court was today, sworn in as the substantive Chief Justice of Nigeria by the acting President of Nigeria, Prof. Yemi Osibanjo. The ceremony which took place at the council chambers of Aso Rock presidential villa, Abuja, had the Onnoghen’s family, Senate President Bukola Saraki, former CJN Mohammed Mahmud, Justices of the Supreme Court and other divisions, as well as Ministers in attendance. retired Justice Mahmoud Mohammed. Prof. Osibanjo also disclosed that President Buhari asked him to tell the new Chief Justice of Nigeria, that he's assuming office at a time “when all arms of government suffers from loss of confidence from the people”. The new Chief Justice of Nigeria who was conferred with the Grand Commander of the Niger, GCON title, thanked Nigerians for their support and also said his loyalty to Nigeria will never waiver. “To Nigerians who had kept the faith, some have even fasted, I say a big thank you,” he said.